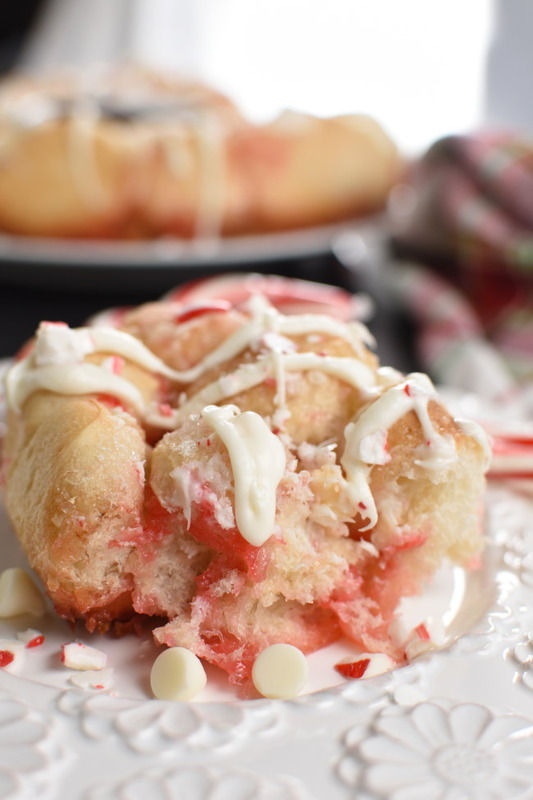 Peppermint Bark Monkey Bread is the perfect holiday breakfast sweet bread! 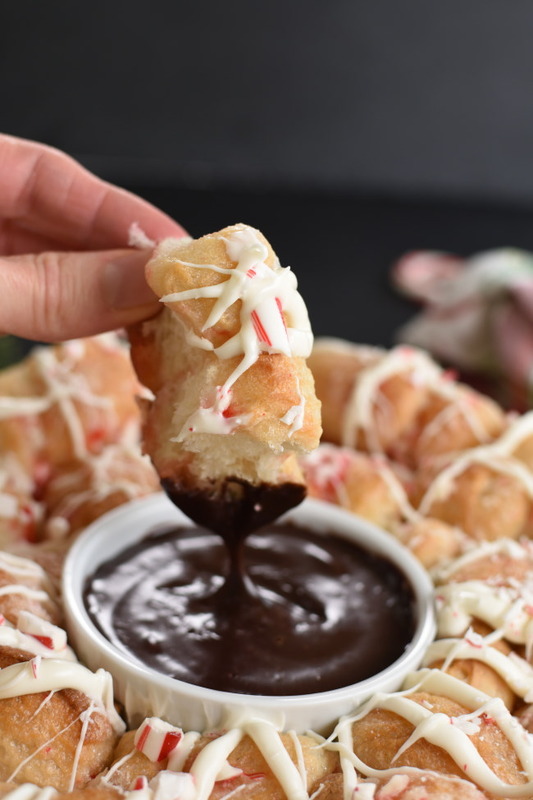 Everyone will enjoy gathering around the festive pull apart wreath and dipping little pieces of freshly baked bread in warm chocolate sauce! 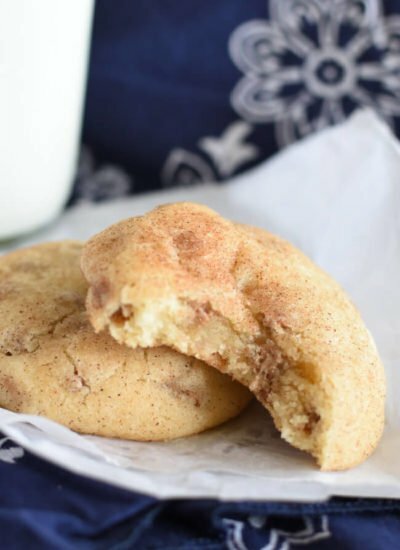 It’s an easy recipe that’s sure to become one of your Christmas favorites! Is it just me or is life getting crazier and crazier? When I was a new mother a friend suggested I be at the crossroads in my kids lives. I’ve tried really hard to take that advice to heart. I try to be home from running errands or whatever I’m doing so I can be there when the kids get home from school. I try to be home and on weekends. Being with them is my favorite thing in the world. It seems like lately though, I’m at the crossroads and all we really have time for is waving to each other. We’re always in hustle to move on to the next activity, appointment, job, etc. Ya, I’m home when they arrive, but am I really available? There’s a difference between being home, and being available and attentive. Life’s speeding by, my oldest is almost eighteen. He’s a senior in highschool, and yes I’m wiping tears off my keyboard. So for now, I’m trying really hard to create moments that allow us, even require us, to slow down and enjoy each other. We LOVE gathering around the kitchen table and telling stories, catching up on each others day, and giggling together. 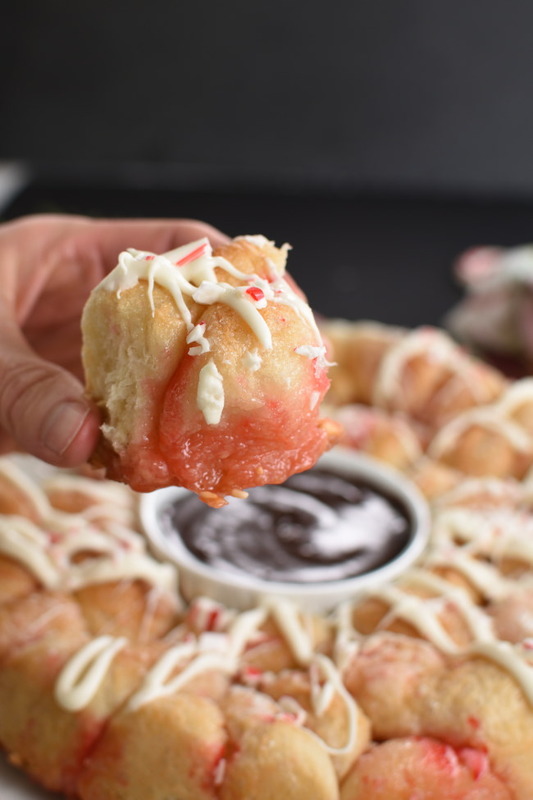 Peppermint Bark Monkey Bread is one of those breakfasts, treats, snacks, side dishes, or treats that allows us to sit and enjoy each other. It’s more than just gobbling breakfast down, it’s sitting a pulling off a piece of monkey bread, visiting, grabbing another chunk, and on to a few more stories! Now that is exactly the kind of recipe I want to make anytime, but especially during the holidays. It’s almost feels like time stands still for just a few minutes. I’m in love with everything about that! On to the recipe! 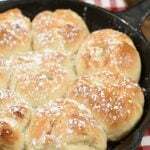 Rhodes rolls are my favorite bread to use in my monkey bread. It’s every bit as delicious as homemade bread without all of the extra work. Now that’s my kind of shortcut! I always have a bag of Rhodes rolls in my freezer which means I can make monkey bread anytime without having to go to the grocery store. Just be sure to use each bag of monkey bread before the expiration date. Expired rolls might not rise properly. Not to worry though, once you get hooked on their rolls you’ll find yourself going through bags of them in no time at all. To make Peppermint Bark Monkey Bread you’ll need 12 Rhodes rolls. Let them thaw in a greased pan just until they’re soft enough to cut with a pair of scissors. Wrap the outside of a 10″ spring-form with aluminum foil. Those pans aren’t completely sealed on the bottom and might leak a little bit as the monkey bread bakes. 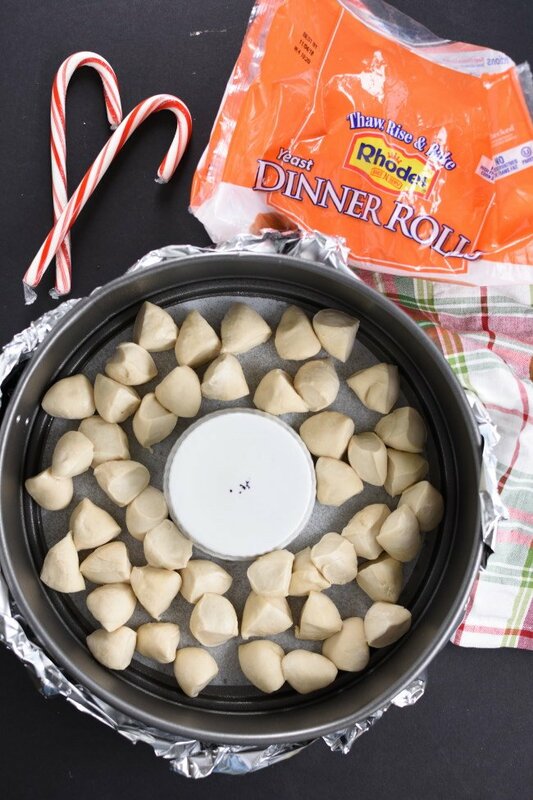 Wrapping it in foil and baking it on a baking sheet will help eliminate spills. Grease the inside of spring-form pan with non-stick baking spray. I also laid a precut piece of parchment paper in the bottom of the pan. Set a ramekin in the center of the pan to help shape the monkey bread into a wreath. Cut rolls in quarters and place evenly around the ramekin. 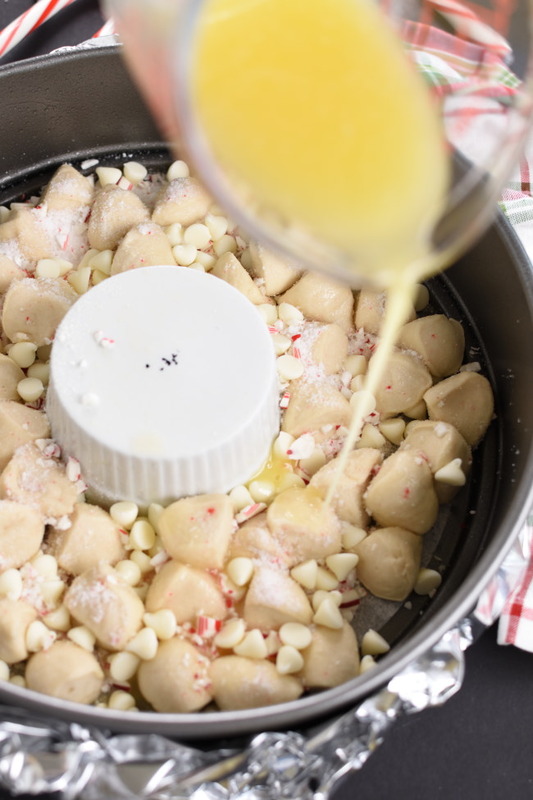 Sprinkle with crushed candy canes and sugar. Sprinkle white chocolate chips over the top. 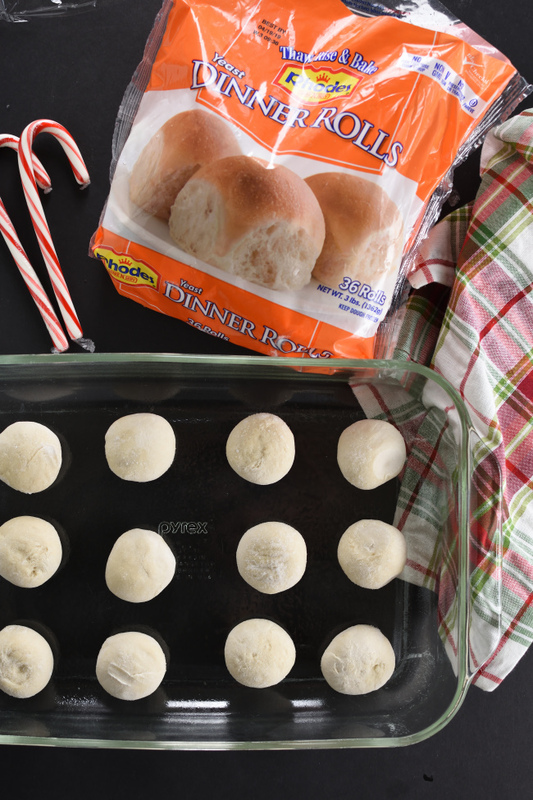 Gently move rolls around to all some of the sugar and candy canes to coat the rolls. Drizzle with butter and peppermint extract. Cover with greased plastic wrap and either refrigerate until morning, or let rise in a warm place until doubled in size. Once monkey bread has doubled in size it’s almost ready to bake. 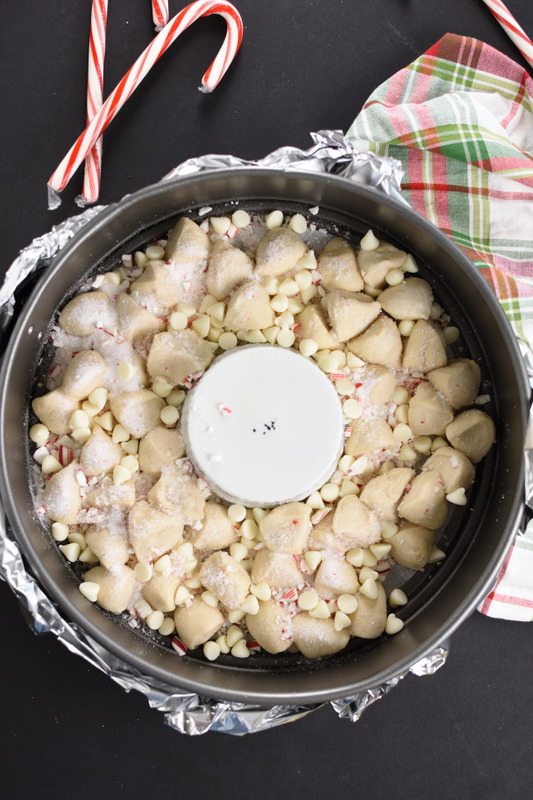 Sprinkle the reserved sugar and crushed candy canes over the top and THEN bake! Remove from oven. Let rest for about 5 minutes. Run a rubber scraper around the edges of the pan to loosen monkey bread. Flip bread out of pan, then flip again so the top side is up and place on a serving plate. 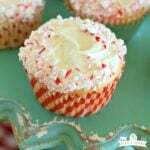 Drizzle with white chocolate and sprinkle with extra crushed candy canes if desired. Fill ramekin with chocolate dipping sauce. This dipping sauce is easy to make. Microwave whipping cream, chocolate chips, and butter in the microwave for one minute 10 seconds. Let sit for a minute, then whisk until smooth. Add a dash of salt if desired. Set ramekin in the center of the wreath. 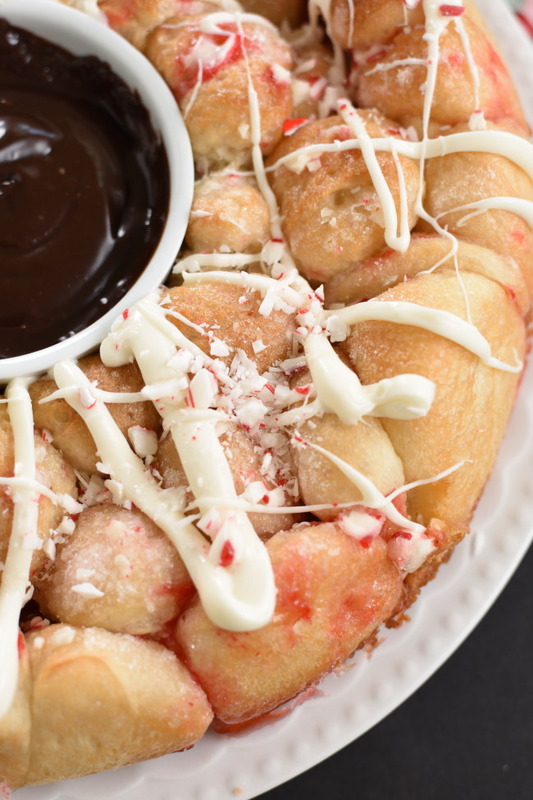 Gather around and serve Peppermint Bark Monkey Bread while it’s still warm! After the bread has cooled a bit those candy canes will start to set up a bit and it will get a little crunchy on the bottom. That’s delish too, but if you want it soft serve while it’s still warm. If you need to serve it later you can always warm it up for a minute in the microwave! 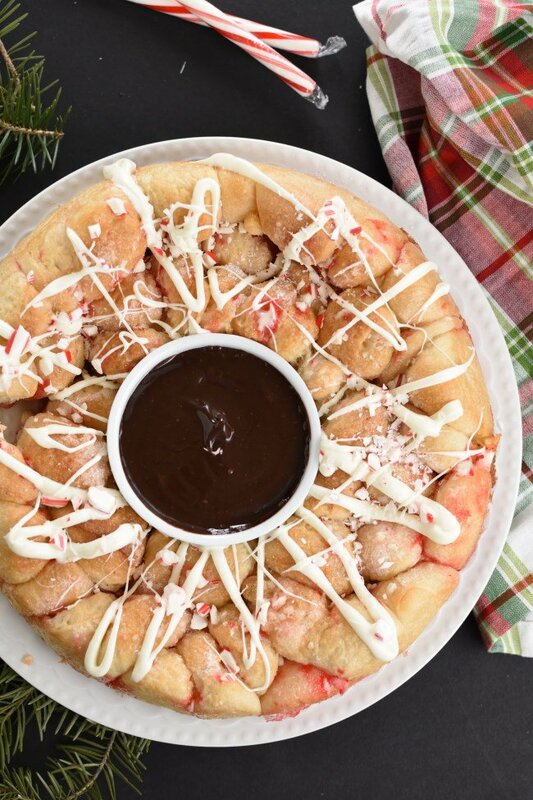 Seriously, who wouldn’t want to gather around this Peppermint Bark Monkey Bread and dive head first into that dish of chocolate sauce? My family sat at the table grabbing a chunk of pull apart bread, telling stories, and giggling for quite a while last night. It was such a bummer when the monkey bread was gone, and we remembered the kids had finals today! School always ruins all the fun! 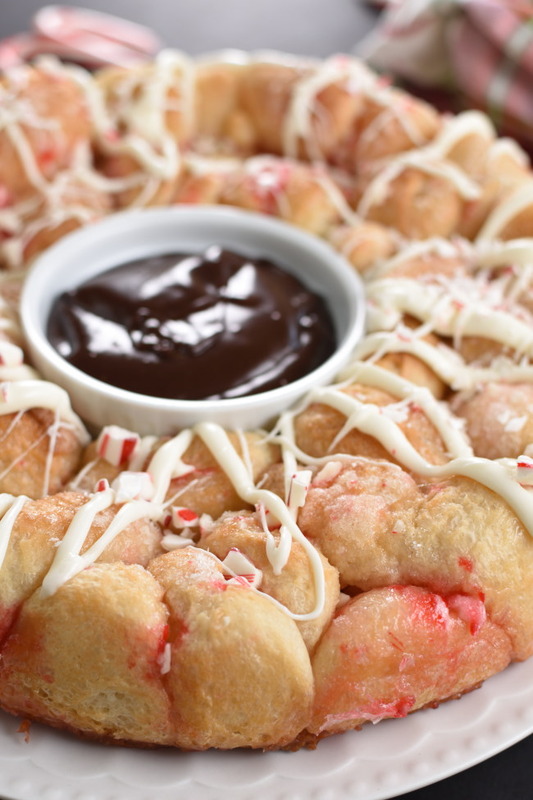 Enjoy Peppermint Bark Monkey Bread! Enjoy your kids! Heck, just enjoy! 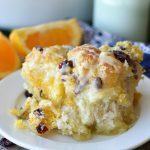 Oh and check out my Cheesy Bacon Ranch Monkey Bread and Easy Cranberry Orange Monkey Bread recipes for more ideas! 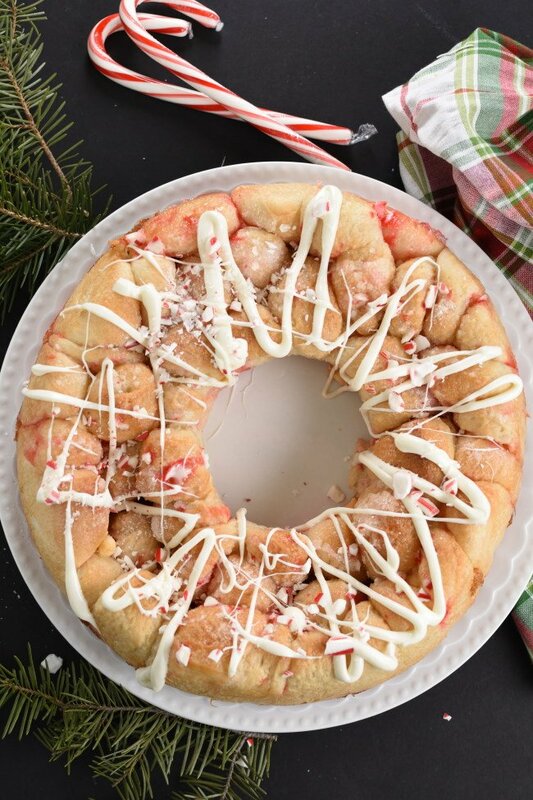 Peppermint Bark Monkey Bread is an essential holiday pull apart bread! It's just like homemade bread, dipped in butter, sprinkled with crushed candy canes, and dunked in chocolate! It's what dreams are made of! Thaw Rhodes rolls on in a greased pan, covered with greased plastic wrap, just until soft enough to cut in pieces. Wrap the outside of a 10" spring form pan with aluminum foil. This will prevent butter from dripping in the oven. I also set the pan on a cookie sheet while baking just to be sure it doesn't spill in my clean oven! Set a ramekin in the center of spring form pan. Spray inside of spring form pan and around the rameking with baking spray. Cut rolls in quarters. The easiest way to cut them is with a pair of kitchen scissors. A knife will work if you don't have kitchen scissors. 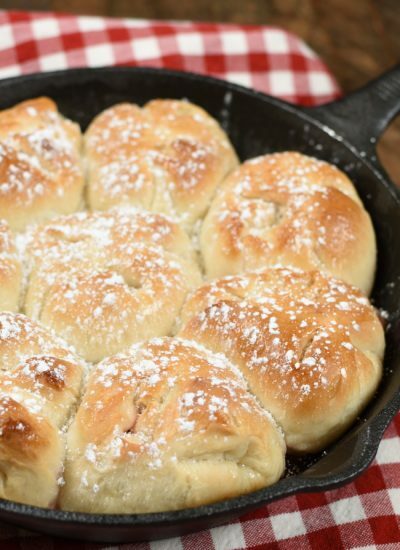 Put quartered rolls in a prepared pan. 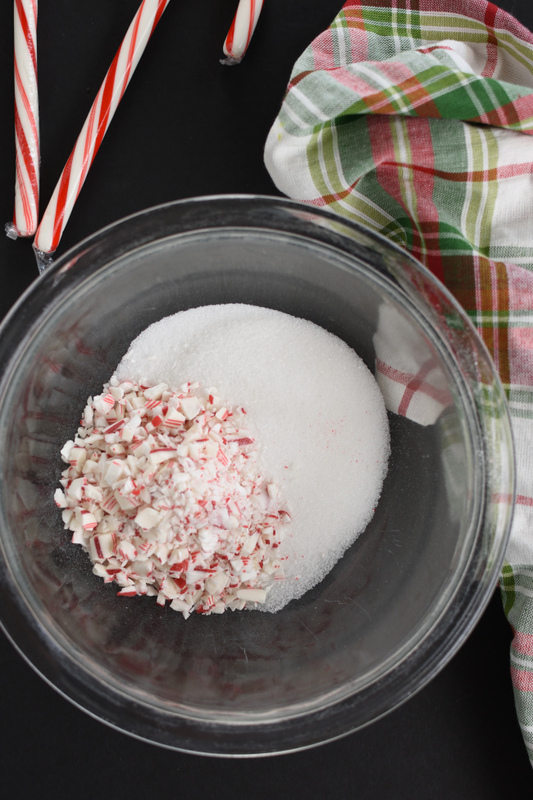 Mix granulated sugar and crushed candy canes. Sprinkle 2/3 of the sugar mixture over rolls in pan, reserve the other 1/3 of the sugar mixture for later. Sprinkle half of the white chocolate chips over monkey bread. Gently move the rolls around to allow part of the sugar mixture to coat the rolls just a little bit. Cover with plastic wrap (sprayed with nonstick baking spray) and refrigerate overnight, or let rise in a warm spot until doubled in size. If monkey bread is in the fridge remove and let sit on the countertop for about 15 minutes. Preheat oven to 350 degrees. While oven is preheating sprinkle remaining candy cane sugar over rolls. Bake for 20-25 minutes. Watch it carefully and if it starts to brown too much before the middle is cooked through, cover it with aluminum foil. After baking remove bread from oven and let rest for about 5 minutes. Run a rubber spatula around the ramekin and edges of pan to loosen bread. Remove ramekin. Flip bread out of pan onto a plate. Then flip again onto a serving plate. So in the end the golden brown top of the monkey bread will still be on top. Melt remaing half of white chips in a sealable bag for about 1 minute, at half power. If chocolate isn't quite melt it, continue microwaving at half power in 15 second intervals. Snip corner off of the bag and drizzle melted chocolate over rolls. Add chocolate chips, butter, and cream to a microwave safe bowl. Microwave for one minute. Stir. If chocolate chips aren't completely melted continue microwaving in 10 second intervals, stirring after each interval. Add salt to taste. Fill ramekin a clean ramekin with warm chocolate sauce and set in the center of monkey bread. Serve warm! Or microwave if needed! 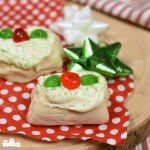 What a fun holiday twist on a family favorite! This would make a great Christmas morning treat! It would be divine for Christmas morning! Especially since you can assemble them the night before and make them in the morning! Enjoy! My kids are begging me to make this! Thank you for sharing it looks so tasty! Hey Amanda! This is a fantastic recipe to let the kids help with! They would have so much fun snipping the rolls in quarters, and crushing candy canes is always a blast! Enjoy those little ones, they grow way too fast! 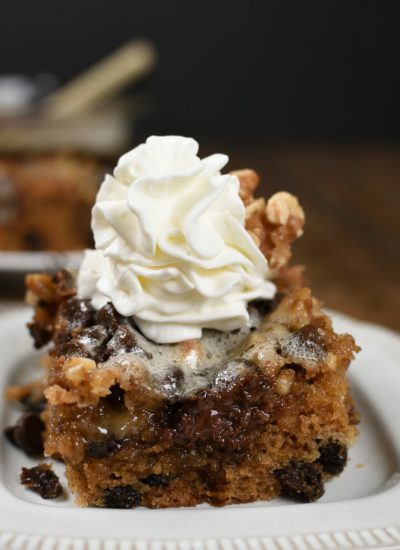 We love monkey bread and this is such a great twist for the holidays!! Isn’t monkey bread the best! It’s so easy, yet it looks fancy! We could all use a few more recipes like that for the holidays right? And yes! I’m loving this flavor combo! Looks heavenly! I am totally drooling over this goodness! It is every bit as drool worthy as you are imagining! Adding a favorite flavor combo to freshly baked bread is heavenly! 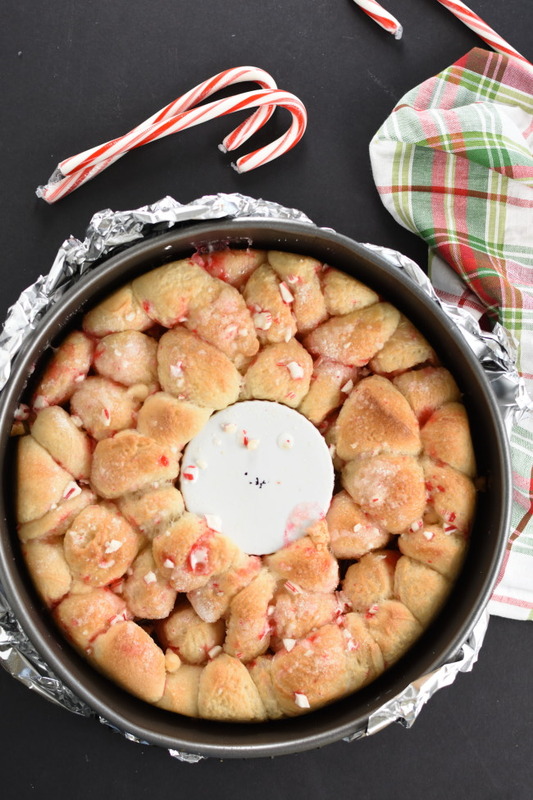 Peppermint + monkey bread! This is genius! I can’t wait to make it this holiday season. Thank you! 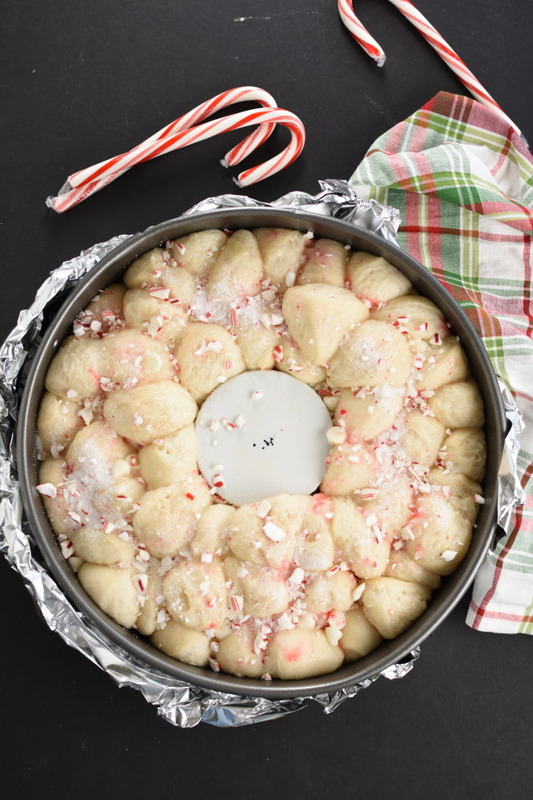 This monkey bread is everything I already love about homemade bread and peppermint barked all wrapped together! It’s a holiday must make! What a great afterschool snack during the cold winter months! Yes! My kids are always happy to be home from school, but coming home to this! Now that’s even better! I really love this idea! Looks really good! Thanks! 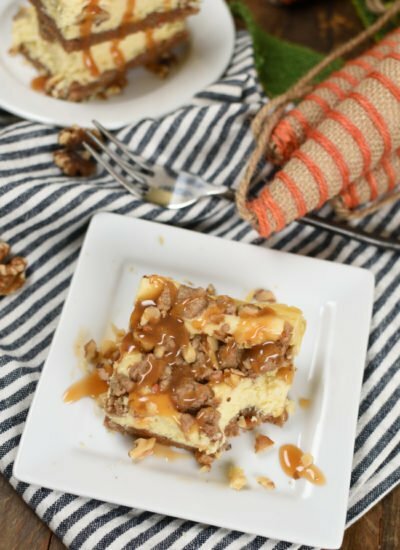 It’s one of those super easy holiday breakfasts ideas!